PCHPs play a vital role in health care service delivery in Bangladesh. This health service provider group includes pharmacists, drug sellers and non-graduate practicing health providers. It is often the first point of contact at the community level for minor ailments such as diarrhea, cough and fever. In many cases, these providers have little or no formal training and lack the skills needed to deliver service at a minimally acceptable level. To help build some capacity, SMC came forward with a Health Providers Training Program (HPTP) in 1986 and has been implementing this program since then. Over a period of time, the program has been redesigned with an aim to develop a cadre of motivated and proactive providers so that they can provide quality information/services to the customers they serve and limit the irrational use of drugs including the misuse of antibiotics. Currently, about 4,500 providers are engaged to offer follow up doses of injectable contraceptive administration, counsel and distribute micronutrient powder to the caregivers of under-five children, counsel and distribution of zinc as an adjunct therapy in diarrhea. Besides, they also play an important role to limit irrational use of drugs among the customer who come to their pharmacy to purchase medicine for other purpose. 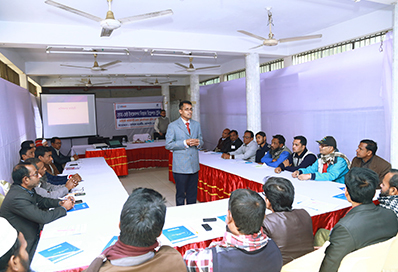 The Program is managed by three training teams located at Dhaka, Bogra and Khulna region with active support from other program personnel at the field to monitor and onsite technical support for quality service delivery including ensure necessary logistics among the PCHP.